Adding a custom-built gunite pool is just the beginning. Many times, people envisioning a new pool for their backyard don’t really look beyond the pool. Yet your new pool area can be so much more, not only expanding your entertainment options but also extending the amount of time you can enjoy it as well. Liquid Assets Pools specializes in turning dreams into reality. And if you’re having trouble envisioning the possibilities, our talented team of designers can wow you with a 3D plan that will turn your backyard into a true outdoor oasis and then oversee the process every step of the way – from concept through completion. 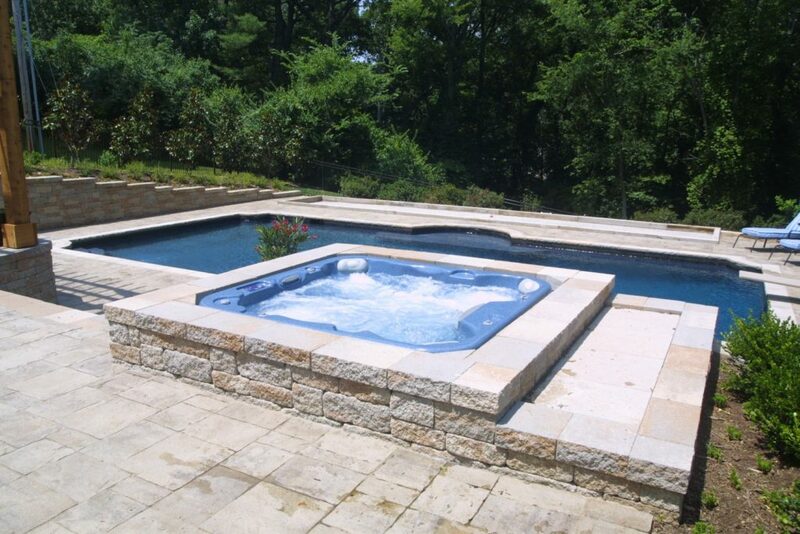 Our custom designed gunite constructed pools are just the beginning. Any size. Any shape. With a myriad style of finishes, textures and tiling to make your pool a true object of beauty but with all the functionality and long-term performance built right in. Want to add a slide, waterfalls or a few fountains into the mix? We’ve got you covered. 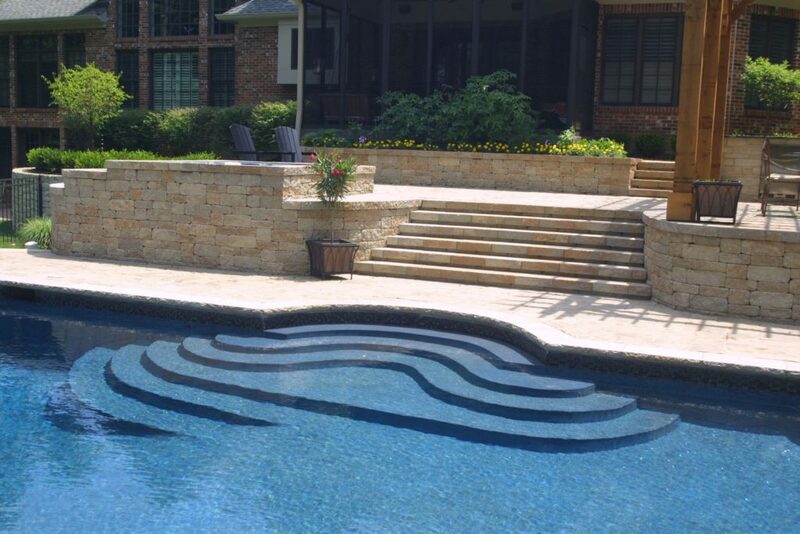 We’ll make a visual impression with stunning designs that blend right into the natural surroundings, creating a seamless link between your home and the entire pool area. Decks, walkouts, retaining walls, rock walls – we get all of them working as one in the overall design. 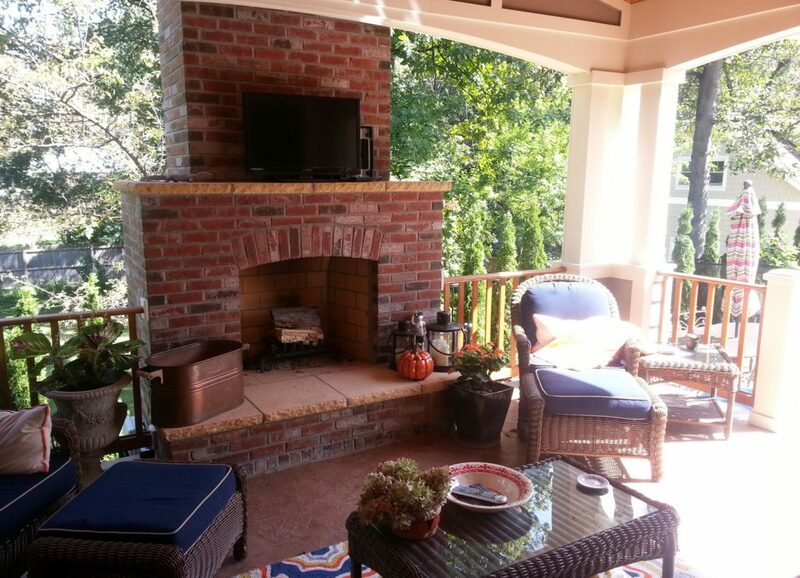 Here are a few of the many ways that we can turn your backyard into an outdoor oasis. houses. Whether you’re looking to incorporate an outdoor kitchen, bar, fireplace, changing room or any combination of these, our designs are the perfect blend of form, functionality and style. 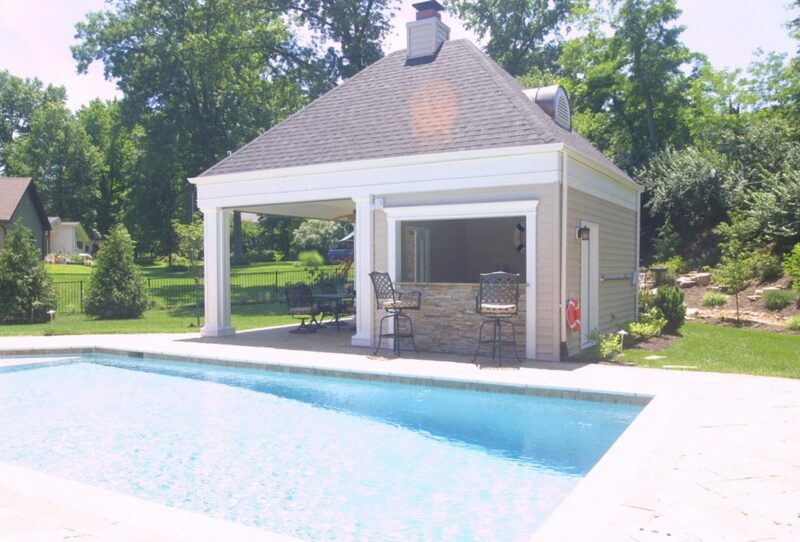 Get a custom-built pool house designed to your specifications. Pergolas – We can show you a variety of innovative uses of building materials to assure that with your new pergola, you’ll have it made in the shade. Relax and enjoy under the comfort of your very own pergola. Fire pits and fireplaces – Extend your pool season and expand your entertainment options with a gorgeous fire pit or fireplace. Gather round and enjoy the comforting flames of an outdoor fireplace. 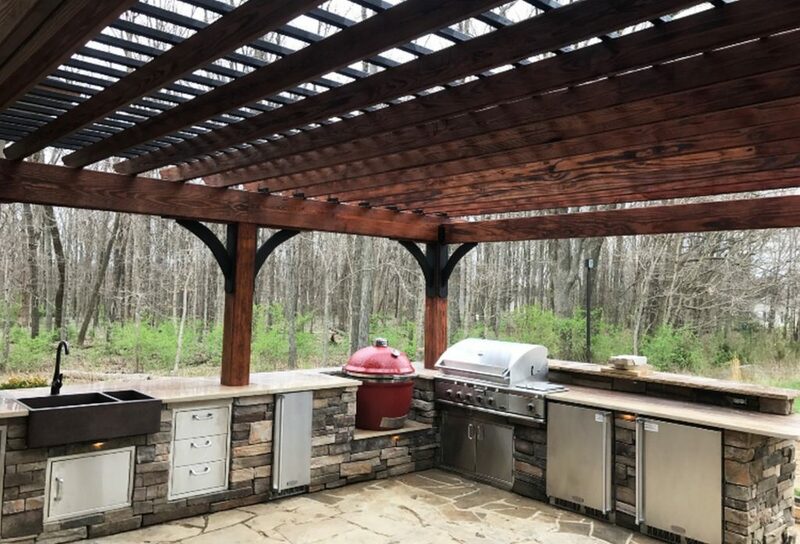 Outdoor kitchens – Whether it’s a part of your pool house or underneath your pergola, we can help design an outdoor kitchen with all the modern conveniences built right in. Turn your pool area into a chef’s delight with a custom-built outdoor kitchen. 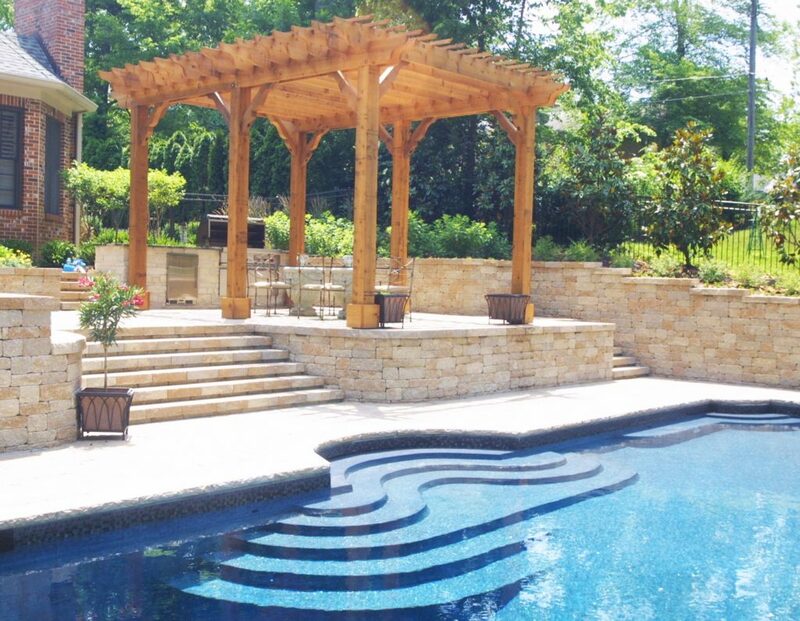 Hot tubs, spas and whirlpools – Incorporating a hot tub, whirlpool or spa into your overall pool area design adds another dimension to your outdoor water options. 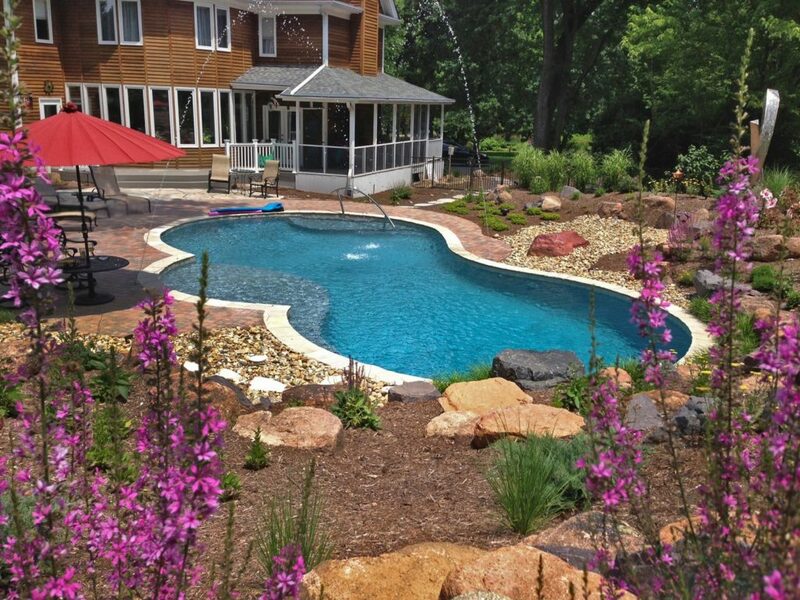 Standalone designs as well as natural extensions of your pool – we specialize in each. What’s your pleasure? A hot tub, spa or whirlpool? We build them all. Walkouts from your house to the pool deck – We can show you a variety of walkway design options – concrete, brick, tiles, pavers, combined with landscaping options that are both practical and make a strong visual statement. There’s nothing like a dramatic entrance to allow you to make a dramatic entrance. The key to it all is to think beyond your pool and consider the total backyard experience. Obviously, budget plays into the equation and we’ll design to work within yours. It all starts with a free consultation. Call us today at 314-822-SWIM.